The 2018 OCMC Mission Team to Indonesia taught the Faith in Bali before spending time at the St. Thomas Orthodox Home for Children in the town of Singaraja where they spent time with the kids doing crafts and activities. On June 29, an OCMC team of 3 volunteers was graciously received by Fr. Stephanos Nino Boik on the island of Bali, Indonesia, and had the opportunity to witness his fruitful ministries there. 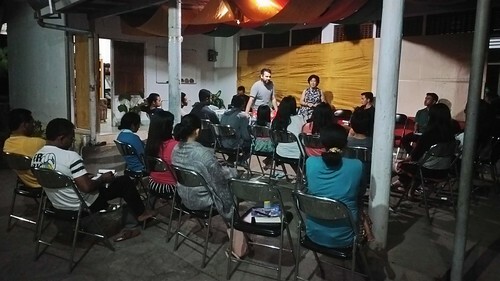 Over the course of one week, the team participated in these ministries, donating time and talent to lead teaching sessions and various activities with the Orthodox Christians in Bali. The team spent the first half of the week leading teaching and discussion sessions with the Orthodox adults in the main city of Denpasar. For the second half of the trip, the team joined Fr. Stephanos at the St. Thomas Orthodox Home for Children in the town of Singaraja – a ministry supported by funds raised through OCMC’s Agape Canister Program. At the orphanage, the team offered a variety of lessons, crafts, and activities. There were about 15 young people in attendance, as well as some adults from the area. A few even traveled all the way from the island of Timor to be edified by the visit of the OCMC team! Each day at the St. Thomas House began and ended with prayer led by the kids. The OCMC team presented their sessions each morning and evening and had some time each afternoon to interact with the kids and chat with the adults. During one afternoon, the team taught the kids to tie prayer ropes. This took off with them, and by the end of the week the kids were spending every free moment making prayer ropes! The Church has its difficulties in Indonesia, but the team was struck by their fervor. Despite various adversities, the Orthodox faithful yearn for anything that will help them grow in their faith. The men visiting from the island of Timor were especially motivated and planned to bring all that they learned back home with them, to help the Church grow there too. The Orthodox Church has only started to grow in Indonesia during the past 30 years, and despite its share of great challenges, it has already seen tremendous progress in that time. Most of all, it was amazing to see the apostolic missionary spirit so active, right from the beginning of the life of the Church there. As His Eminence Metropolitan Konstantinos of Singapore and South Asia told the 2015 OCMC team to Medan, Indonesia: “The most important thing you are bringing to the Orthodox Christians of Indonesia is a sense that they are not alone in the world. As few as they are, these relationships with Orthodox Christians around the world strengthen and encourage them to continue to grow in their faith.” The same relationships formed with this year’s team to Bali and reinforced both the faith of the Indonesians, as well as that of the visiting team members. This team to Bali is one of the many opportunities offered by OCMC to share Christ’s love with our brothers and sisters around the world! Please prayerfully consider other upcoming opportunities, which you can find by going to ocmc.org or by calling OCMC at 1-877-463-6787 (ext. 142).